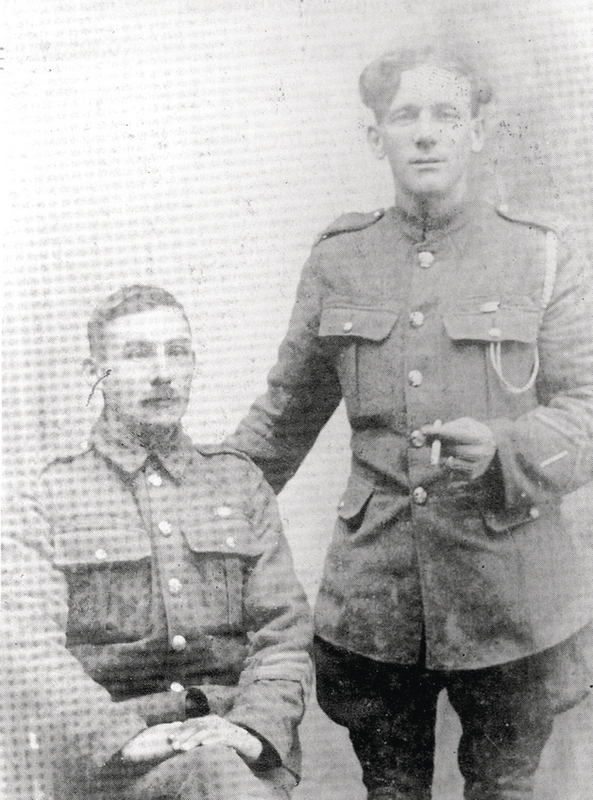 Private John Oliver of the Connaught Rangers (seated left) and his friend bandsman Tom Wall on leave together in their native Loughrea. At the beginning of the last century, two boys grew up together in Loughrea. Socially they were far apart, but they were great friends. John Oliver was from a particularly poor background. His family lived in a tiny lean-to shack out on the Galway road on the edge of the town. His friend was Tom Wall, who lived in a comfortable house on Patrick Street. John enjoyed visiting their home. His friend played with a band, The Saharas, and there was often music and fun in their house, shared by his brother Ray, and their attractive sister Cissie. They joined the army at different times. As soon as he was 18 years of age in 1905, John joined the Connaught Rangers. It was probably the only job he was able to get. He was quickly swept off to India, to a totally new life. But at the outbreak of war, John’s unit sailed from Karachi on August 28 1914, arriving at Marseilles one month later. They were taken immediately to northern France where frantic efforts were being made to hold the line at the Mons-Condé canal region against the advancing Germans. I can only guess at what the psychological effect of all this had on John Oliver, because I next hear of him being court martialled for ‘drunkenness, insubordination, and threatening’. He was sentenced to 35 days of field punishment, where he was forced to do hard labour while shackled to a heavy object. In contrast, John Oliver’s friend, Tom Wall, had an easier war. He enlisted in an artillery unit in 1915, and although he served during the war as a driver, his musical background kept him away from the battlefields, as he played in the regiment’s band. The following year the Connaught Rangers left France and sailed to Mesopotamia. On January 10 1916 they landed at Basra, and joined in the rescue attempt to save the joint British and Indian held garrison that was cut off, and surrounded by the Turks, at Kut-al-Amara. Again there was a series of deadly engagements; but all attempts to relieve the garrison failed. In desperation the British secretly offered £2 million, and a promise that they would not fight the Ottoman Turks again, if they were allowed to lead their troops to safety. ** The offer was rejected. On April 29 1916, after a siege of 147 days, Kut-al-Amara surrendered. Around 13,000 British and Indian troops were taken prisoner. It was one of the most humiliating defeats of the war. The Connaught Rangers withdrew to Palestine, and three years later, John Oliver sailed once more with his regiment for India. This time a different India was emerging. India had committed more than one million men to the British cause during World War I, of whom more than 74,000 were killed and another 67,000 wounded. A new mood was emerging throughout that great continent. There were the beginnings of civil disobedience against British rule, some non-violent resistance began to take hold. Britain reacted with many generous reforms, but cracked down hard on any sort of protest, as it had at Amritsar in 1919, where 400 protesters were shot dead. The main Connaught Rangers force was stationed on the plains of the Punjab, at Jullundur (formerly Jalandhar ), while John Oliver and others were posted to the Solon hill station about 20 miles away on the foothills of the Himalayas. * In 1925 J E Edmonds, the British Official Historian recorded that a great number of Belgian casualties had been suffered from 15 to 25 October 1914, including 121,562 killed or wounded. British casualties from 14 October to 30 November were 58,155, French losses were 86,237. The total German casualties in Belgium and northern France from 15 October to 24 November were 134,315 men, of whom 46,765 losses were incurred on the front from the Lys to Gheluvelt between 30 October and 24 November.